Thomas mostly uses Hawaii's Koa wood for his wood sculptures but occasionally will use other exotic woods of Hawaii. 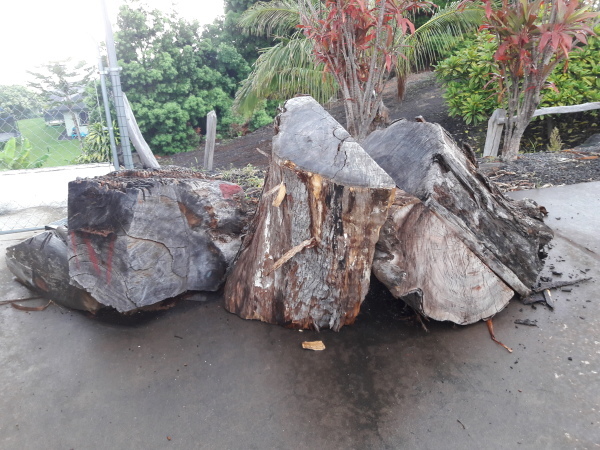 The state of Hawaii has a moratorium on Koa, it is illegal to cut healthy Koa trees. All of Tom's Koa wood carvings are made from rescued wood that has fallen in storms on the top of the mountain. The many colors and facets of Hawaii's Koa wood make for some of the most spectacular wood carvings and sculptures you have ever seen. When you see one of Tom's Koa wood turtles for sale, with the many colors that change as your view changes or the curly flame pattern across the turtles back, you will fall in love with Koa too. Thomas always sands the carving to a 220 grit sandpaper before applying 10 to 15 coats of clear lacquer, sanding between each coat. The final step is to polish the sculpture with a very fine compound and buff to a silky smooth finish. 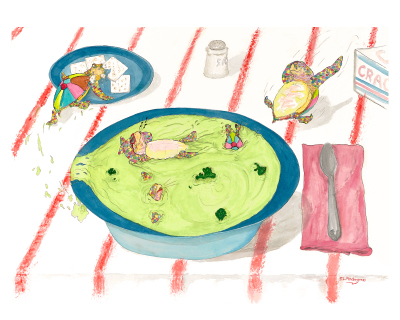 Thomas' Sea Life Paintings are usually whimsical and colorful depictions of Turtles as well as other sea life in fun situations. He of course also does more serious paintings of sea life too as well as some abstract paintings. Tom's painting mediums range from watercolor to oil paint to acrylic paintings. All giclees are on canvas and fine art prints on paper. Tom has been painting on and off since his childhood but unfortunately never photographed his work for reproduction. More paintings to come very soon. Turtles have always been Tom's most popular wood sculptures and are still his best-selling wood carvings. The Hawaiian Green Sea Turtles or "Honu" are found in all coastal waters of Hawaii. Vistors from all over the world love to see the Turtles up close but they are protected and you are not allowed too close. Everyone likes to take a memory of their visit to Hawaii home with them and Tom's wood Turtles seem to be a great one. Thomas' wood turtles have been for sale on the Big Island since he carved his first turtle in 1994. Thomas creates his Sea Life drawings on acid-free 300lb watercolor paper using archival inks. The original Ink drawings are for sale in Galleries on Hawaii The Big Island. 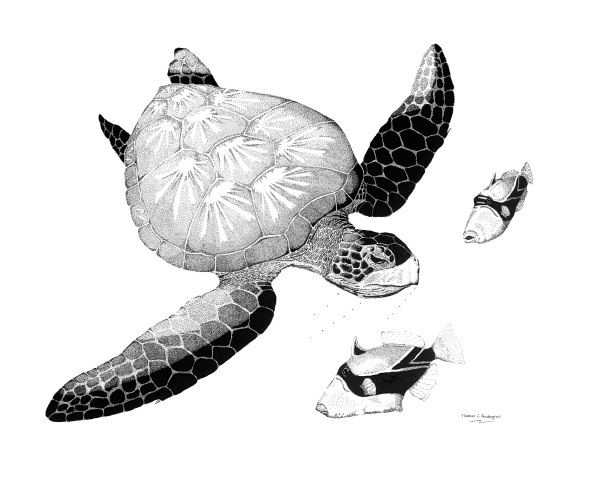 Giclees of all Sea Life drawings are available on watercolor paper in two sizes, 22x30 or 16x20. We also offer Fine Art Prints on photo paper with a satin finish, to mimic the texture of the paper the original was done on, available in two sizes 8x10 or 11x14. We offer free shipping on all images. One of Thomas' favorite part of being an artist is having a client share a memory or special occasion with him, and then creating a unique piece. He has designed many extraordinary Wood Sculptures and Sea Life Drawings, commemorating everything from births to weddings; graduations to retirements; catching that monster fish to finishing a race or any other of life's adventures. Miniature to monumental, always on budget and on time. Just contact one of the fine Galleries listed on this site to start the process.